What is my Pickleball Rating? Congratulations go out to the Pickleball Rocks Club of the Month winner, the Greater OKC Pickleball Club. Not only are they one of the fastest growing clubs in the US, they also are one of those special clubs that's active off the court too. It didn't take long to find their most recent benevolent venture as they used playing pickleball as their way of raising over $2000 for one of their local charities, Edmond Mobile Meals. And they are not resting there as coming up next is a Pickleball Play-a-thon to raise money and awareness for Alzheimer's. We love a fast growing pickleball club, but we love it even more when the club is using that growth to help others in need. What a great spotlight that shines on our wonderful sport. And that helps pickleball grow in every community. Keep up the great work OKC! If you want to join the "Greater OKC Pickleball Club" Join Us Here!! 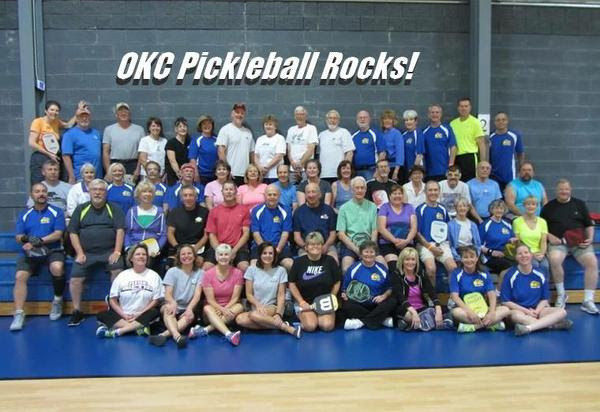 Thirty-nine members of the OKC Pickleball Club participated in the games and brought home 59 of the 73 medals 29 gold medals,18 silver medals & 12 bronze medals. More pictures in the photo gallery. Individual results at left under 2013 Yukon Senior Games. Galen Culver from Channel 4(kfor) came out 11/27 for about an hour & a half. He took pictures for the first hour and then interview Vicky and a new player(Grif Henderson). Galen then played a couple of games and seemed to enjoy it. On Mondays & Wednesdays from 8:30-11:00 at the Quail Springs Baptist Church Gym. Come out and join us. All you need to bring are your tennis shoes. We provide paddles and balls. 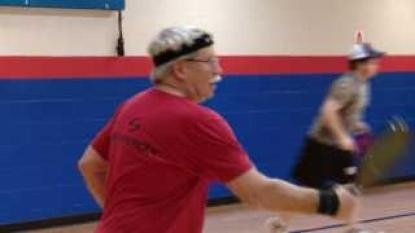 The Oklahoma City Pickleball Club took the Senior Olympics by storm. Twenty-two of our members entered the tournament and nineteen of them came home with thirty-eight medals. To see individual results go to the category on left for 2012 Senior Olympic results. OKC Pickleball Club finally has night time and Saturday pickleball!! Lynn Whipple worked with the Holy Trinity Lutheran Church, 308 NW 164th St, Edmond, OK. We have three courts in the Family Life Center from 6-9 pm on Friday evenings & 1-4 pm on Saturday afternoons. A security system only allows PB players in the Family Life Center during the above time. Consult your email box often for Church reserved weekends, we will post as we are aware of these. Pictures of gym above. Denzel Oldham worked with Exchange Avenue Baptist Church, 1312 S. Pennsylvania, Oklahoma City, OK. We have three courts in the gym from 6-9 pm on Monday evenings. Pictures of first night in gym above. Eight members of the OKC Pickleball Club participated in the games and brought home 14 gold medals and 2 bronze medals. Six of these members are pictured above: Vicky Noakes, Laura Grooms, Debra Law, Don Noakes, Lindell Mills, and Denzel Oldham. More pictures in the photo gallery. 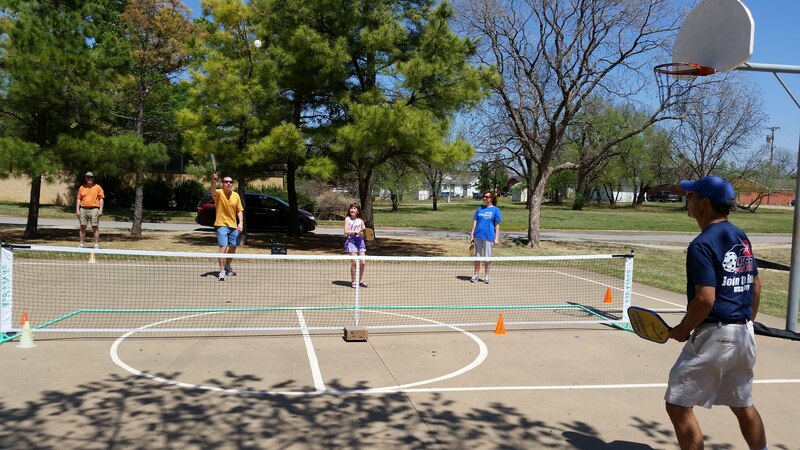 "Pickleball in the Park" - Stephenson Park on April 12, 2014 "Pickleball in the Park" was a hugh success. It was a team effort initiated by the Edmond Parks and Rec with the help of the Greater OKC Pickleball Club. Yesterday was a bright sunny day with a little too much wind but it didn't stop the GOPB volunteers or Edmondites from coming out to learn the game. We had 80 people sign in. 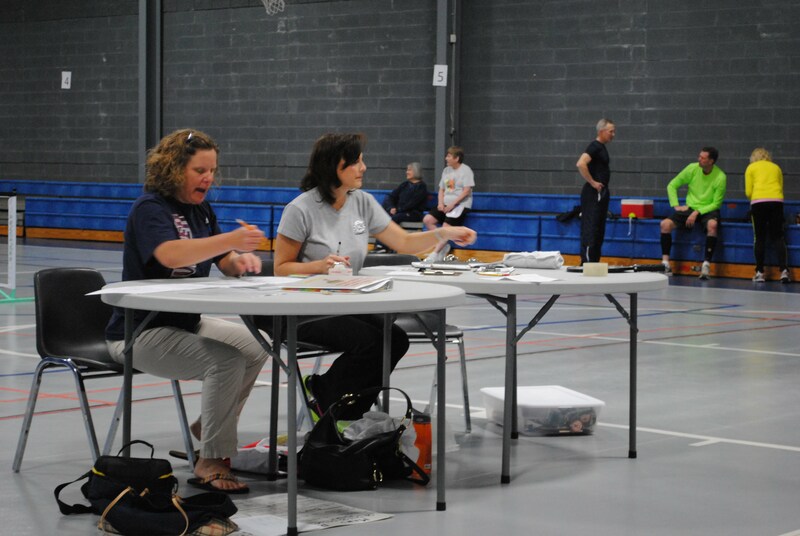 Thirty-seven adults and thirteen kids signed waivers and learned how to play pickleball. After talking with the Edmond Parks & Rec it looks like a strong possibility that they will turn these 2 tennis courts into 4 permanent pickleball courts. When that happens plan on outdoor leagues and pickleball in the park all the time! 2014 Name change and new logo In late February of 2014 OKC Pickleball Club had 175 members & officially changed their name and logo to Greater OKC Pickleball Club to better describe the community that we serve. We also filed for a Not for Profit Certificate of Incorporation & it was issued 2/24/2014, opened a Bank Account for GOPB, club ratings were completed & appointed officers. Vicky Noakes-President Jimmy Mock Vice President/Treasurer Michelle Simpson Secretary/Membership This is our new logo. 2014 Yukon Senior Games Update The Greater OKC Pickleball Club coordinated the Yukon Senior Games in April. The entries increased from 51 last year to 71 this year. We had sixty-two GOPB members enter, up from thirty-seven entered last year & many volunteers helped out. We won 76 of the 101 medals with them being 31 gold, 30 silver & 15 bronze. Sherry Prince selected as new Edmond USAPA Ambassador Sherry has been an active member of the OK City PB Club for some time. She shares her knowledge of pb with everyone she meets. She has lived in the area for 30 years is very involved with the community. She and her husband have opened a pickleball store called Boulevard Paddles in Edmond. 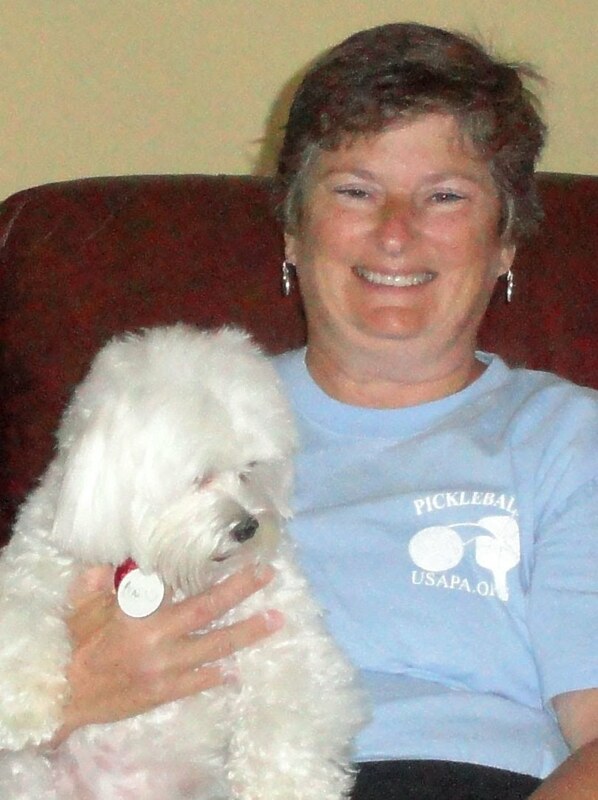 Sherry is full of energy, an asset to the club & plans to spread the word about pickleball to everyone she meets. 2013 Yukon Senior Games Update The OKC Pickleball Club coordinated the Yukon Senior Games in April. The entries increased from 22 last year to 51 this year. We had thirty-seven enter the tournament & many volunteers helped out. We won 59 of the 73 medals with them being 29 gold, 18 silver & 12 bronze. Oklahoma City West USAPA Ambassador Peggy Cobb of Yukon has been playing pickleball for a couple of years & has made a big impact in the number of places pickleball is being played in OKC. She is responsible for adding courts as well as playing days/evenings at several locations. She is moving to Saddlebrook, AZ but is still helping out in OKC.